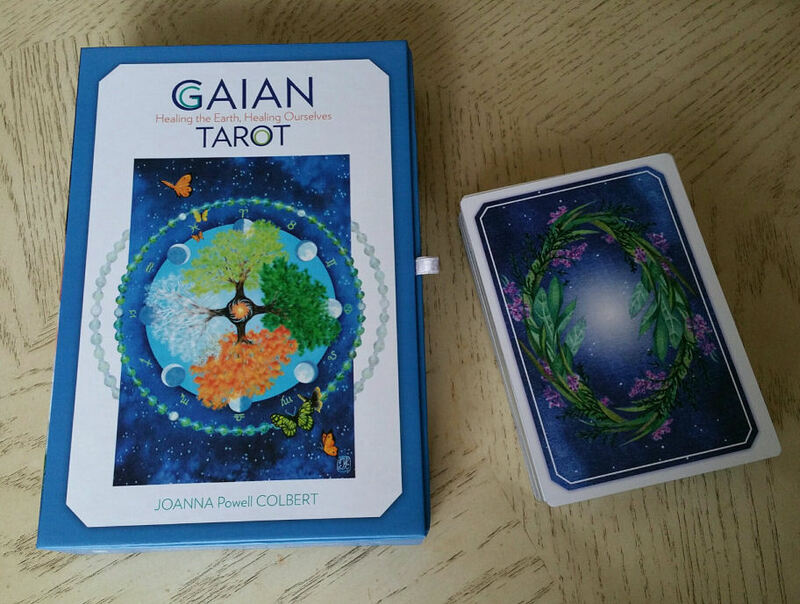 A deck that taps into earth consciousness like no other deck, the Gaian Tarot is the much talked about, beloved, and exceptional deck borne from the genius of artist and writer Joanna Powell Colbert. The Gaian Tarot was initially self-published by Colbert in 2010, and then it’s popularity convinced Llewellyn to publish it in 2011, and then somehow mysteriously, it went out of print. Copies of the deck were going for outrageous prices all over the interwebs as folks clamored to get themselves a copy of this beloved deck. Now, be happy all my friends, because the Gaian Tarot is back in a new published version by Schiffer Publishing and I’ve got to say, Schiffer has done a remarkable job with Colbert’s work. Here’s an interesting point about this deck. 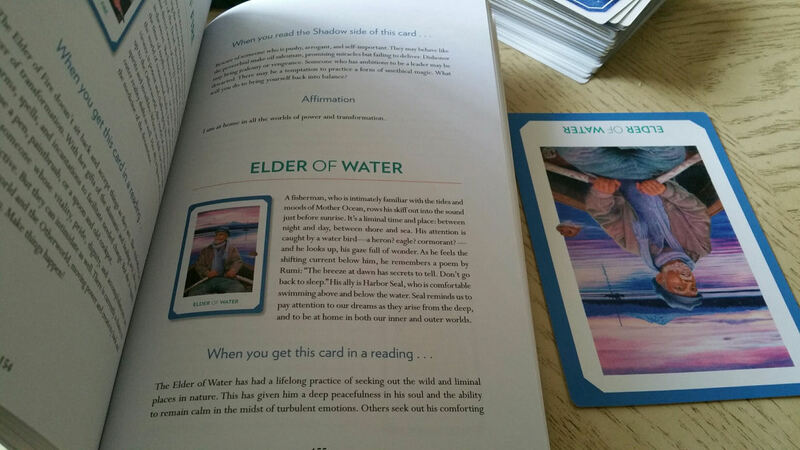 At least four professional writers I am connected with use the Gaian Tarot for creative writing. One writes women’s fiction, one writes metaphysical books, one writes literary fiction (with a collection of short stories that has won prestigious book awards), and one is a bestselling author. 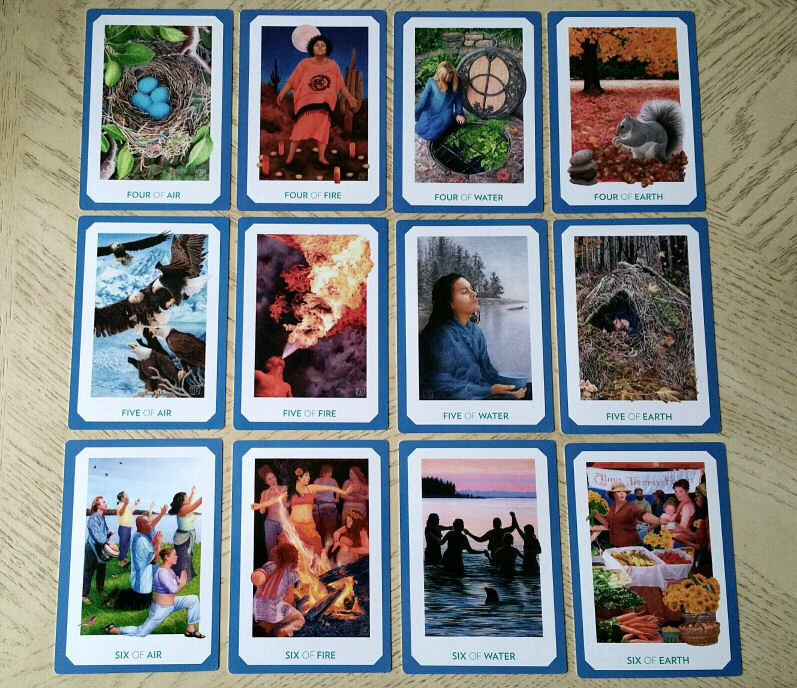 Only one of them– that I know of– subscribes to a pagan-based spiritual path, and the only reason I mention that is to showcase the diversity and versatility of this deck. I don’t know if it was ever intentionally meant to become a “writer’s tarot deck,” but that it certainly has! Be sure to read about Colbert’s creative process for the deck here. From what I could gather, Colbert works with mixed media. The inspiration for each Gaian Tarot card image begins with photographs– with one single photograph as the main focal point. Then a photographic collage is used for the background. Layered, the deck image is created. Then Colbert transitions into working by hand. The photographic collage becomes a line drawing and colored pencil sketch, and the final colored pencil sketch is cleaned up digitally. Let’s try a reading for you. Left to right above, the cards represent Mind, Body, and Spirit respectively. However, you’re to choose only one of those three cards. Which would you like to divine upon today? About your Mind, your Body, or your Spirit? Left, center, or right-most card? Remember your selection. 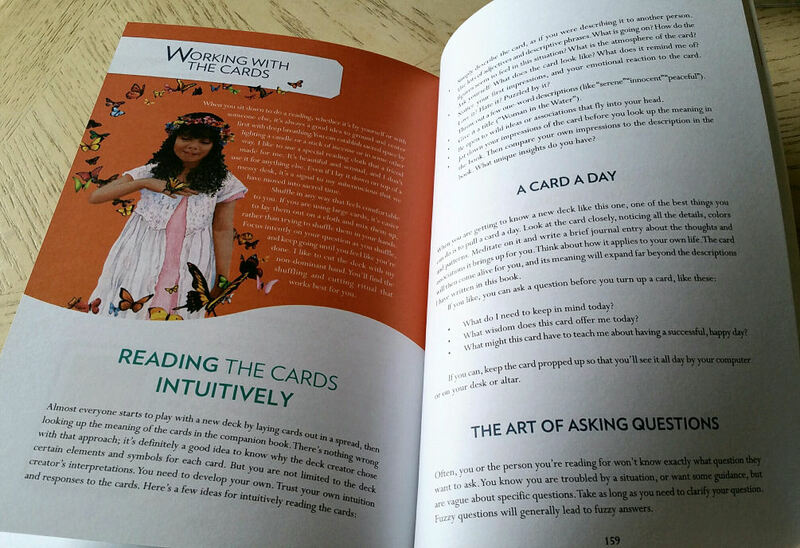 Here I’m lifting the idea of the “Mind, Body, Spirit” spread from the accompanying guidebook comes with instructions for three-card readings. 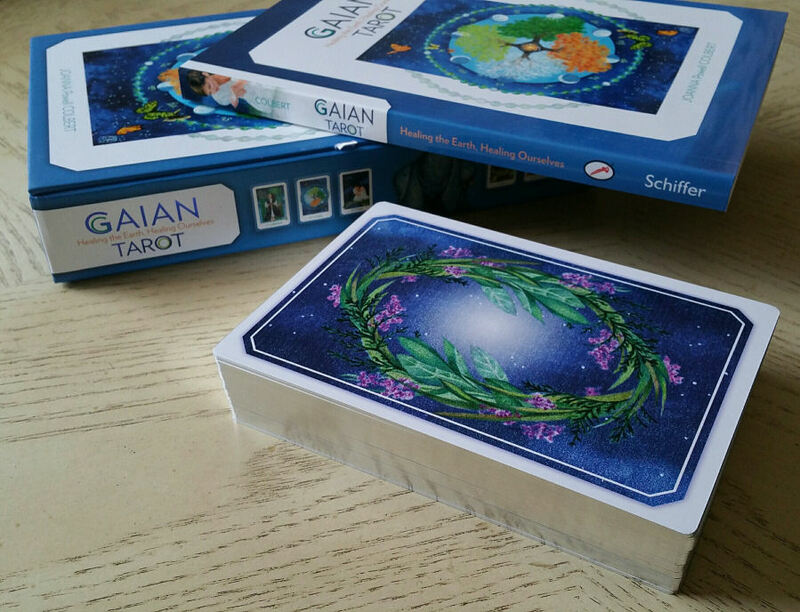 The 2016 re-publication of the Gaian Tarot comes in a beautiful blue and white matte box mixed with high-gloss embossed images. The front box cover features The Wheel card from the deck, which I absolutely love. You see four trees depicting the four seasons, the moon phases encircled around the cross of trees, the twelve zodiac signs representing the ecliptic of the sun, and butterflies representing the changing phases of life, set against a starry background of constellations. I don’t think I’ve seen a more beautiful image, let alone such a beautiful Wheel (Wheel of Fortune) card. I love the detailing here with the semicircle cutouts for easy handling of the cards. It sounds silly and superficial to make mention of the groove, but oh, the many times I’ve struggled with tarot box packaging because these “silly and superficial” details weren’t paid attention to and in that struggle, creased, scratched, or damaged by cards. 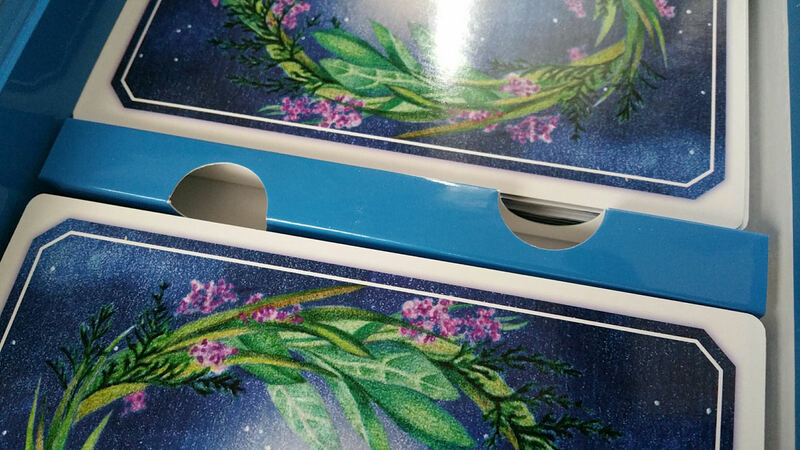 So I’m deeply appreciative of good quality packaging details. Here, Schiffer does a wonderful job. Box and guidebook dimensions are roughly the standard 6″ x 9″ you’ll find for trade paperbacks. Here you have a slightly larger tarot deck that can be awkward handling for smaller hands, but I don’t mind at all. I will work with the awkward handling in exchange for the big, beautiful cards! The deck itself is gilded with silver edging. The card back design is reversible, featuring art done in colored pencil. I love the symbolism here of Heaven and Earth in harmony with the center illuminated point of Spirit. In the wreath you’ll see cedar, sage, sweetgrass, and lavender (a recurring imagery in the World card and Star). These are blessing herbs, and arranged in such a way, symbolize the portal between the physical and the spirit worlds. The entire box set for the Gaian Tarot by Schiffer makes a perfect gift for a writer or someone on an earth- or Divine Feminine- conscious spiritual path, irrespective of whether that person is a tarot reader. The guidebook is why this deck set is perfect, even for those who aren’t familiar with tarot. The above and below photographs give you sampling of the guidebook’s content. Here, you see the entry for Key 0 (traditionally “The Fool”), which is The Seeker in the Gaian Tarot. I love that this card is called The Seeker. There’s a three-page spread for the card. Every Major Arcanum is given three to four pages in this guidebook, so the text is dense with information. 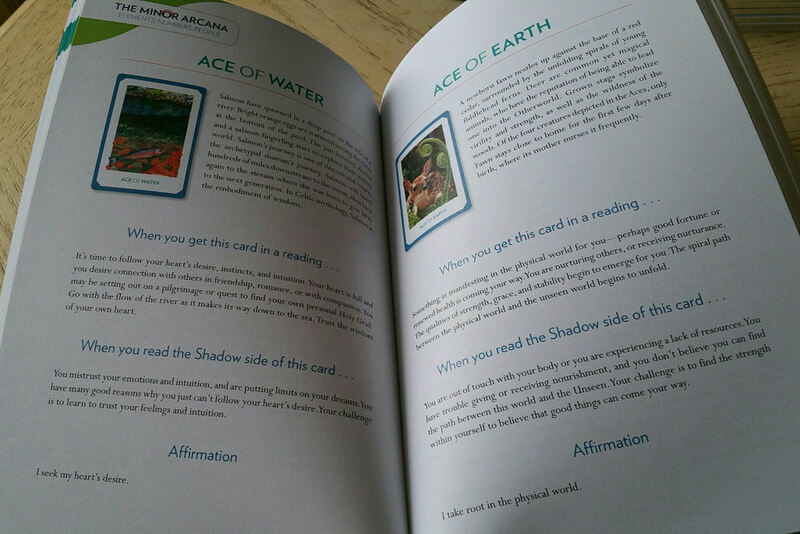 Journaling prompts and affirmations are provided for each card, and if you read with reversals, you can apply the “shadow side” as noted in the guidebook. The guidebook itself is in full color with beautiful layout design and easy-to-follow organization. I love the affirmations. 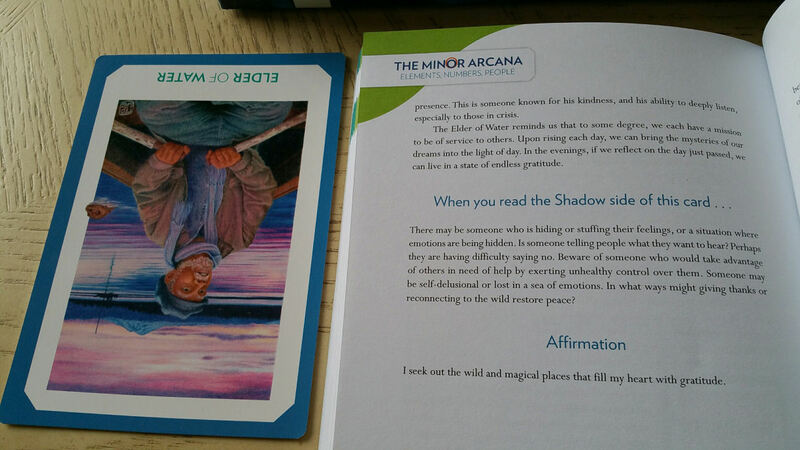 You can do a daily card draw in the mornings, and then find the corresponding entry of that card in the guidebook to read the affirmation. Then adopt that affirmation as your mantra for the day. 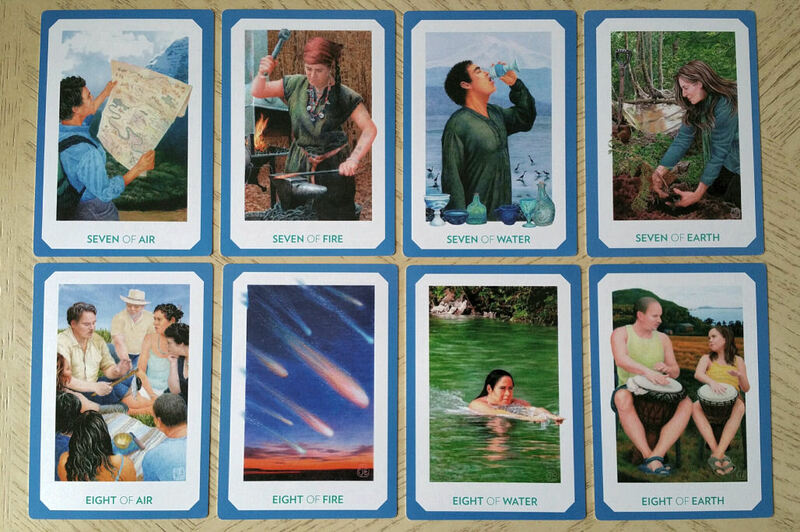 For instance, on this morning that I’m writing my review, I pulled the Eight of Air (corresponding traditional title: Eight of Swords). 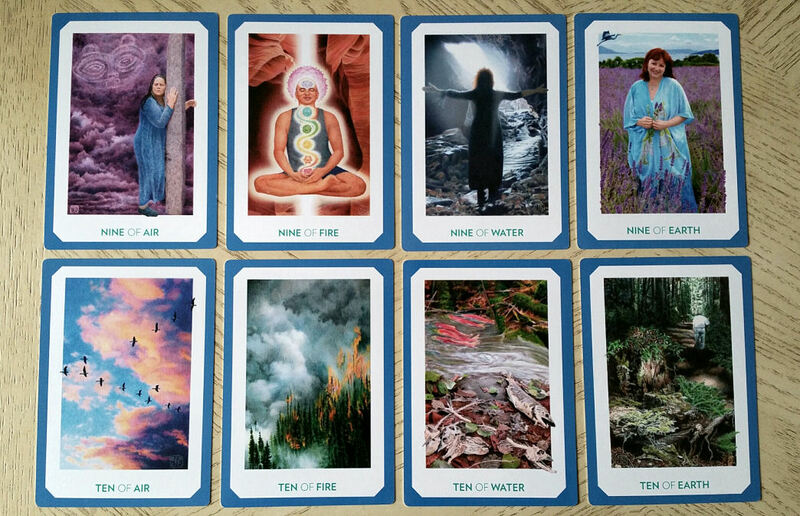 The mantra for the Eight of Air: “We see it, so be it.” If you’re a professional tarot reader, you could integrate these affirmations into your reading services to empower your clients. Though the Majors are given three to four pages per card, the Minors are covered more succinctly– one page per card. You’ll find a description of the card, how to apply its meaning in an actual reading, the shadow side of that card, and an affirmation to use when working with that particular card. I love how much information is covered in the guidebook, which makes this deck set comprehensive and self-contained. I love it as a gift idea, which will come in handy for this year’s holiday season. Now let’s talk about these beautiful cards. Given Colbert’s creative process, there’s incredible photorealism in each card image, yet the cards exude that feeling of meticulous hand-drawn art that I love in tarot decks. I love the perspective and point of view for Key 0, The Seeker card. We see the winding path ahead from the perspective of the seeker and the fox companion evokes the trickster archetype often associated with Key 0, The Fool card. Each card is rich with symbolism, and the guidebook explains many of the features. Nothing is meaningless. Every detail in every card, down to the embroidered butterfly on the seeker’s shirt, is symbolic. Here is where I say you have to read the companion book. I confess I often skip the companion book and find that I don’t miss out on much by skipping it. For Colbert’s deck, you are going to miss out on so much if you skip this guidebook. She’s written one of the best companion books to a deck I’ve come across. Like the symbolism for the white feather in the seeker’s hair, how there are talismans in her knapsack bundle, her walking stick, and so much more. The red and white flowers on the vest The Magician is wearing– the willow in the Priestess card– the Willendorf figurine in The Gardener (Key 3: The Empress), or the narrative being told in the rock carvings in the Strength card (Key 8). Key 15 (traditionally The Devil card) becomes Bindweed. Bindweed are flowers that look beautiful and harmless enough, but are invasive and will suffocate the healthy plant life around them. There is also the evocative sense of binding, or being held hostage from the bindweeds. Once they’ve taken hold, bindweeds are near impossible to eradicate. 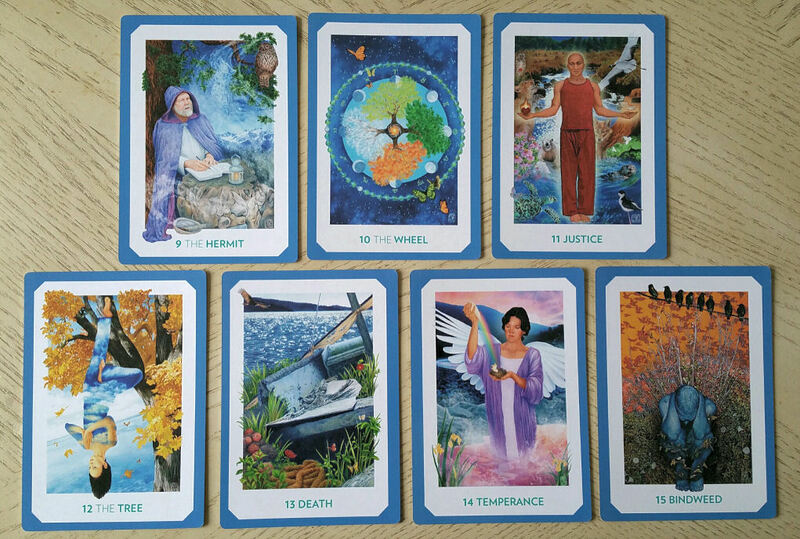 I love everything about Key 15 in the Gaian Tarot. The deck comes ordered by numbers, so the Aces of all four suits– Air, Fire, Water, and Earth, in that order– are grouped together, and then the Twos for all four suits, then the Threes, etc. Air corresponds with Swords; Fire corresponds with Wands; Water corresponds with Cups; and Earth corresponds with Pentacles (or Coins). The significance of elements and numerology are explained in-depth in the guidebook, so a tarot beginner is going to learn a lot about the tarot structure through this Schiffer set. The meanings ascribed to each card in the Gaian Tarot and the symbolism used to evoke those meanings are decidedly grounded in earth-based spiritualism, such as the song, prayer, and drumming in the Six of Air, or the sacred circle depicted in the Four of Fire, or the skyclad mermaid sisters in the Six of Water. Spiritually significant landmarks, such as the Chalice Well in Glastonbury, are also depicted, noting the Four of Water. Although the deck itself is balanced in its depictions of men and women, there is definitely an unabashed celebration of femininity. Femininity and the female body are depicted in natural forms throughout the deck. 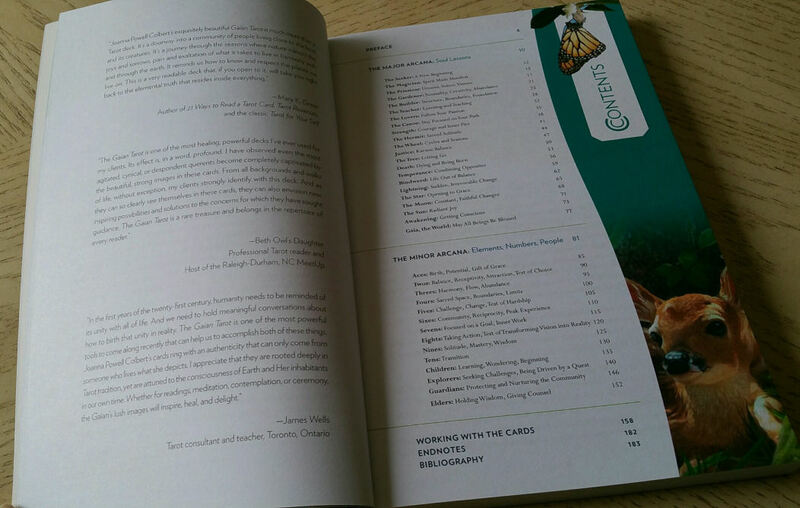 The Gaian Tarot offers new perspectives on the tarot cards. The Seven of Air, for instance, corresponding with the Seven of Swords (in the Rider-Waite-Smith, it’s the one of the figure in a red hat, red boots, absconding away from a tent set-up holding a bundle of swords), here we see a hiker taking a pause to look at his map and figure out which direction he’s going in. The affirmation for the Seven of Air is “I make my plans, but leave room for serendipity.” It works seamlessly with how most might interpret the Seven of Swords but polishes that interpretation for a spirituality-guided reading. The Eight of Water (the Eight of Cups), depicts a woman swimming upstream. I love the Eight of Earth (Eight of Pentacles, the apprentice card)– father teaching daughter how to keep tempo and rhythm with a drum. I love how all the nines show a solitary figure and all the tens are landscapes of nature, landscapes that embody the corresponding element. So much thought, creativity, ingenuity, and artistry went into this deck. 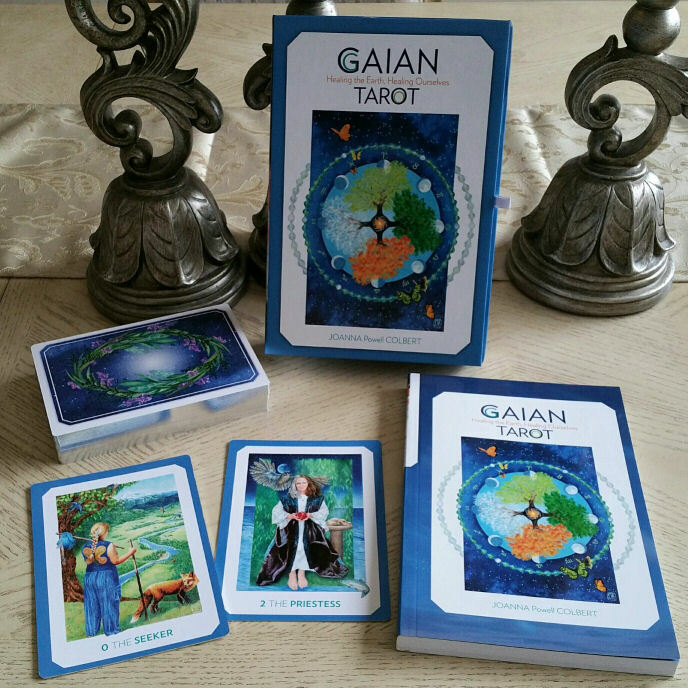 The Gaian Tarot is the perfect deck for those who celebrate nature, the Gaia principle, or the Divine Feminine in their spiritual paths. There is a blending of paganism, Gaian spirituality, womanism, Eastern philosophy, and the celebration of nature and humanity’s relationship with Mother Earth. I love what Colbert has done with the court cards here. The traditional Pages, Knights, Queens, and Kings have been reiterated as Children, Explorers, Guardians, and Elders. Children indicate the personality of discovery. Explorers indicate the growth principle and often, growing pains. The Guardians are about nurturing to fruition. Elders are wise leaders and authority figures, respected in the community. 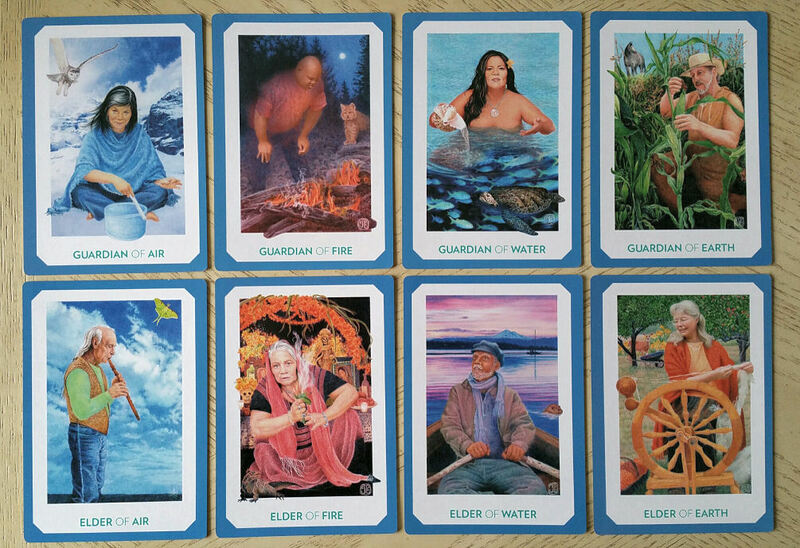 The Gaian Tarot is one of the earliest decks I came across that celebrated realistic depictions of people, in all of our diversity. It depicts people from different cultural, ethnic, social, and even socioeconomic backgrounds. We see both rural and urban dwellers. 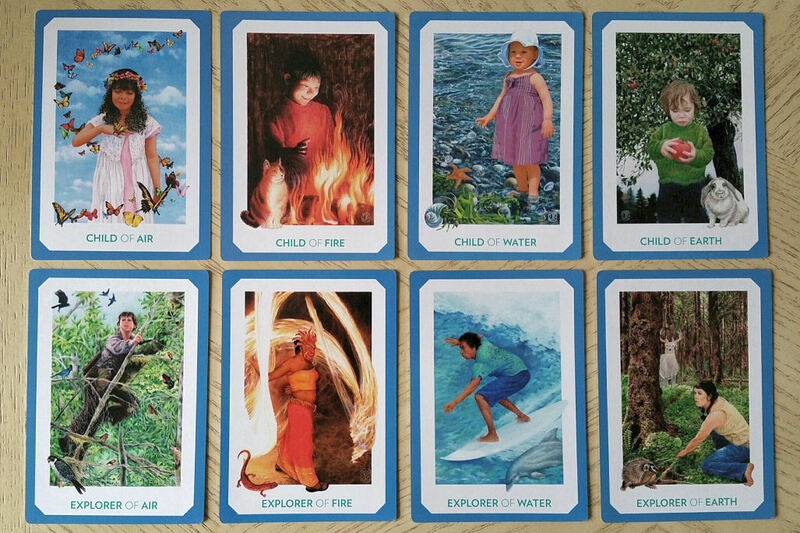 We see the manifold identities of Mother Earth’s children depicted on these cards, and done so in a way that is inviting, seamless, and conscientious. Remember the three cards I had asked to choose from? 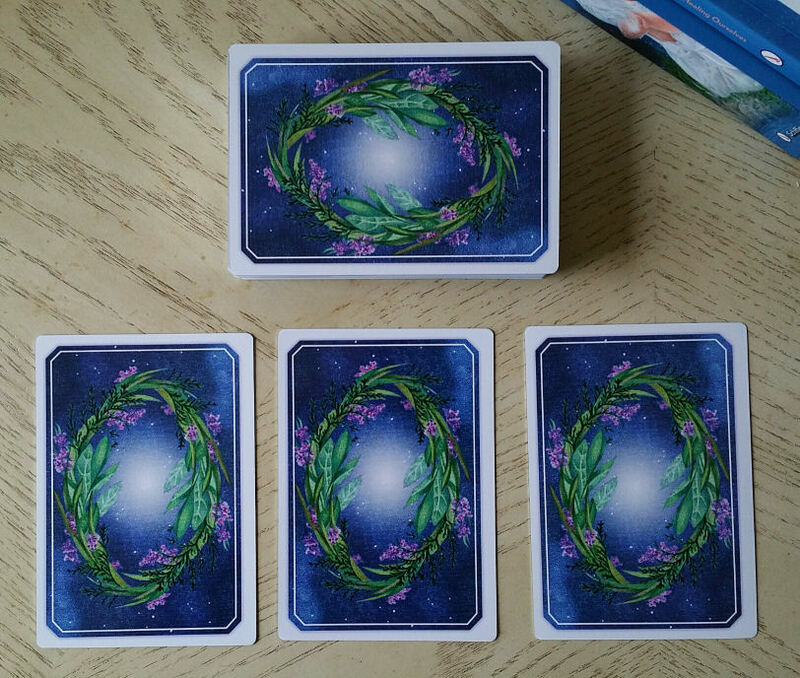 Left to right, the cards represent Mind, Body, and Spirit. 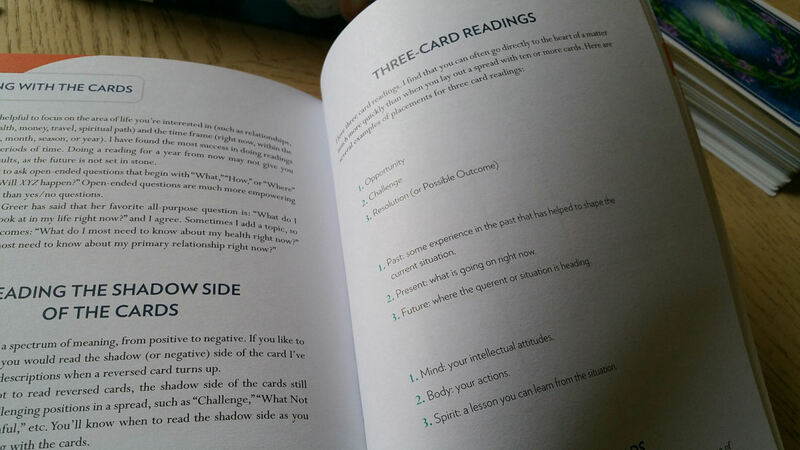 I’m inspired by the Mind, Body, and Spirit three-card layout taught in the Gain Tarot guidebook. Which card did you choose? Note your divinatory message below. Mind. Your intellectual attitudes. 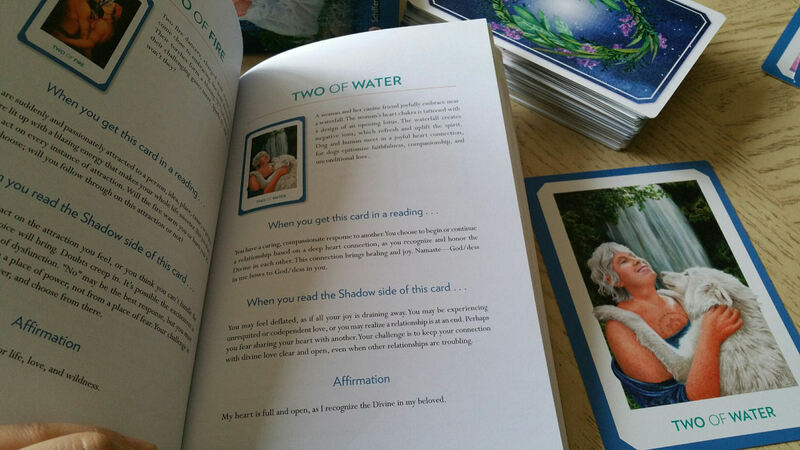 TWO OF WATER | If you seek insight into what you most need to know about your Mind, then your card is the Two of Water. What your mind endeavors in must replenish your spirit. Focus the activities of the mind on that which is compassion-oriented. Body. Your actions. 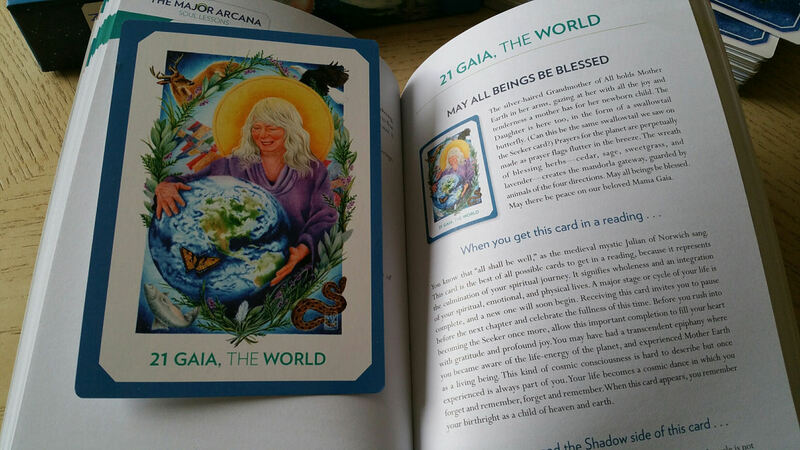 21 GAIA, THE WORLD | If you seek insight into what you most need to know about your physical Body right now, then your card is Gaia, The World. What you are currently experiencing with your physical body is in direct relation with the development of your spiritual body in your karmic journeys. This card is also a reminder that you are a beloved child of Gaia, of God, of Mother Earth, a conscious all-encompassing Spirit that is watching over you. You are not alone. You are being guided and if you are open and receptive to it, you’ll feel that guiding presence over you. Be comforted by that guiding presence. Spirit. A lesson you can learn. ELDER OF WATER (SHADOW) | Here, the card appears in reverse, so we read the Shadow side of the card. If you seek insight into what you most need to know about your Spirit and the purpose of your spiritual journeying at this juncture point, look to the Elder of Water in reverse, its Shadow side. There may be suppression of emotions and feelings and the suppression causes festering, which inhibits spiritual development. You’ll want to address those emotions and feelings you’ve been suppressing. Click on the photographs for an enlarged view of each card and its corresponding guidebook entry. 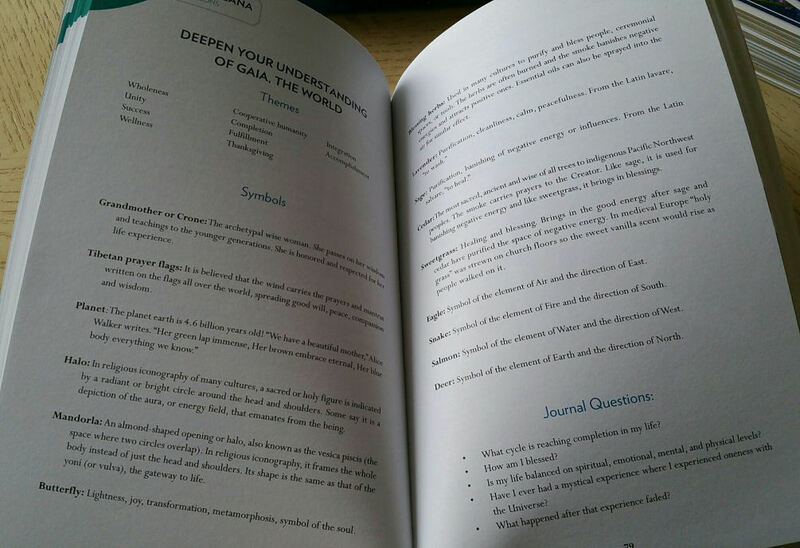 If you chose the Gaia card, perhaps some journaling work will be helpful at this juncture of your path. Consider: what cycle is reaching completion in your life right now? Are you feeling balanced, between your physical body and your spiritual consciousness? Reflect and ruminate on that. Also reflect on a mystical experience you’ve had and how that mystical experience might connect with where you are and what you are going through now in your physical Body. 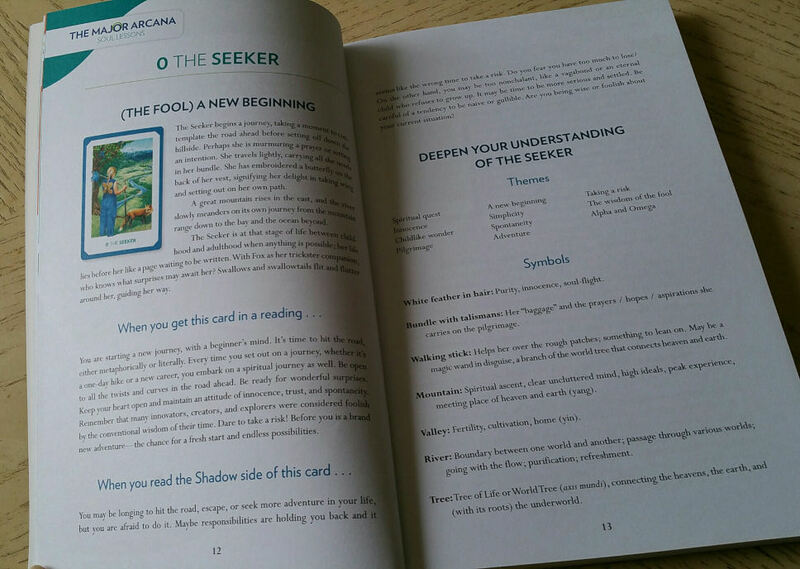 Since Key 21 is a Major Arcanum, here we see a spread of three pages devoted to the Gaia card. Note the keyword themes and coverage of the symbolism in the card imagery. This guidebook is by far one of the most superior tarot guidebooks I’ve come across, and deck creators would do well to follow the example set by Colbert’s guidebook. I love the organization, structure, detail, and thoroughness of this companion text. Given the dedicates passages in the guidebook on the Shadow side of each card, I’ve shuffled the deck in a way to observe card reversals. Here, for Spirit, we get the Elder of Water in reverse. The accompanying entry for the Shadow side of this Elder is in the image below. In your spiritual journeying and where your Spirit is at this moment is in a period of restoration, and to explore restorative energy for yourself. Consider the affirmation “I seek out the wild and magical places that fill my heart with gratitude” in helping you alleviate that emotional suppression, to remove current obstacles in your spiritual path. 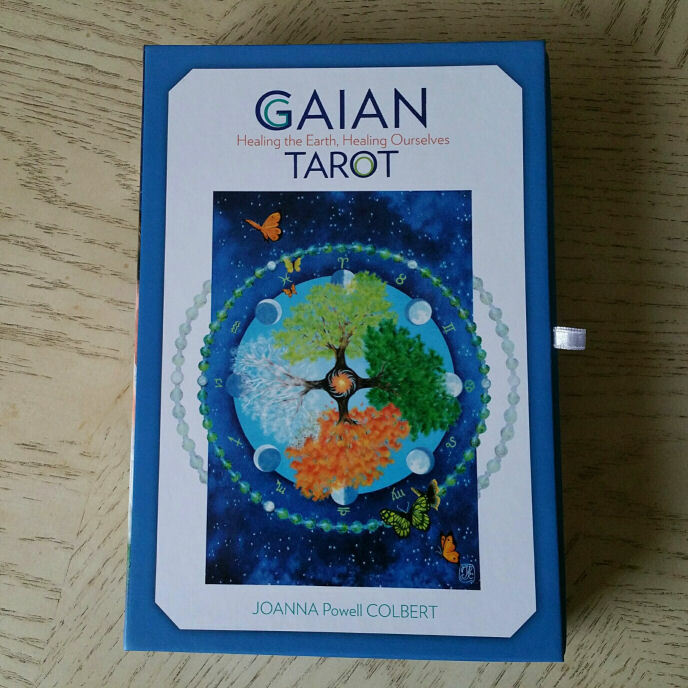 The 2016 version of the Gaian Tarot by Joanna Powell Colbert published by Schiffer is at once both contemporary and mystical, a deck that will be loved by those following women-centered or earth-centered life paths. 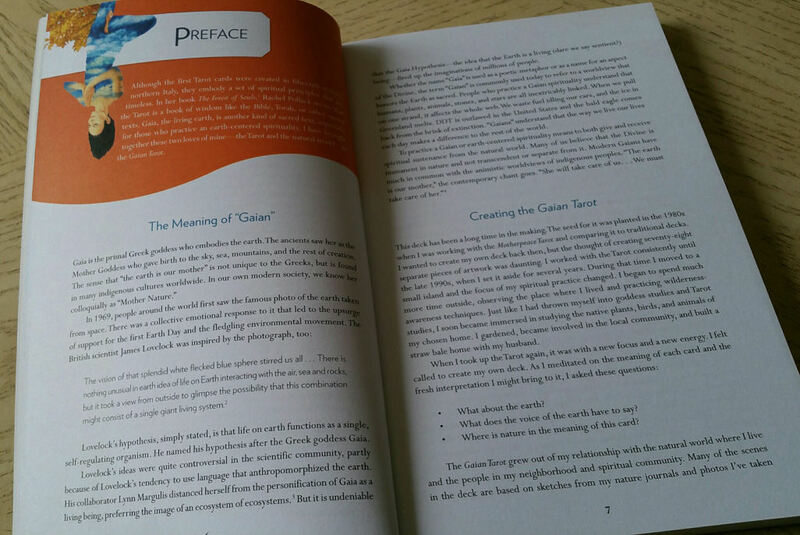 The deck set is an impressive (and useful) gift for anyone who you know would embrace the Gaia principle and Gaian lifestyle, even one with no tarot background. Yet the deck itself is sophisticated and rich with symbolism, which any seasoned tarotist will appreciate. 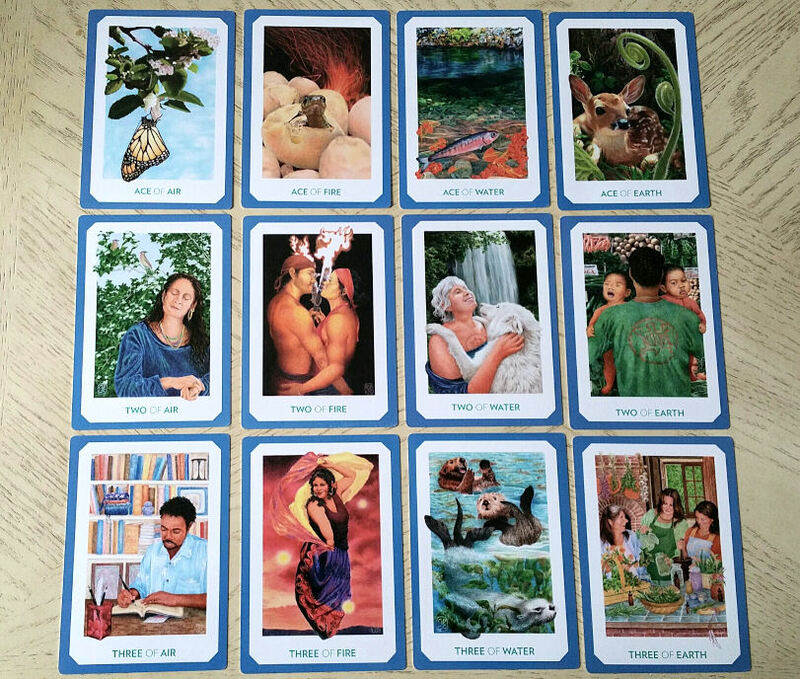 A masterpiece tarot deck that blends the wisdom taught by Mother Earth and showcases the magic that sentient beings can create when we tap into that wisdom, Colbert’s Gaian Tarot reads with astounding accuracy, sincerity, and grace. 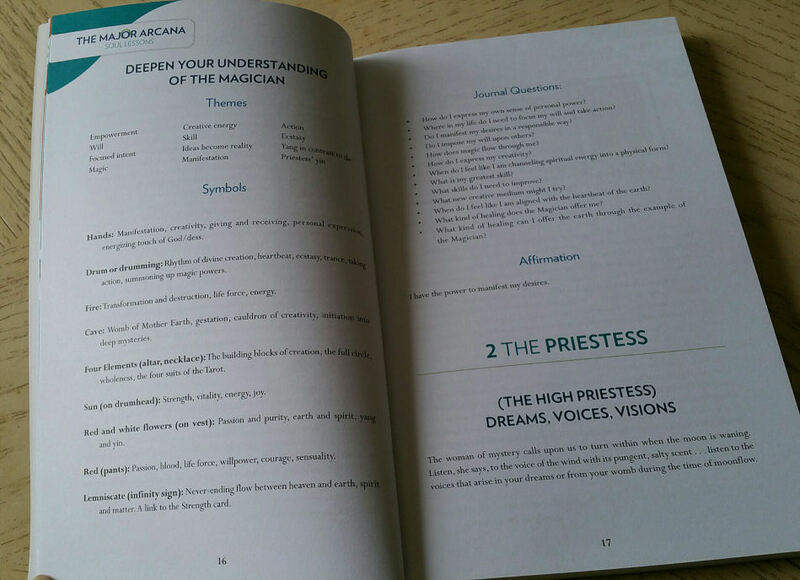 It’s no wonder that time and time again, master tarot readers and bestselling writers turn to the Gaian Tarot for answers. 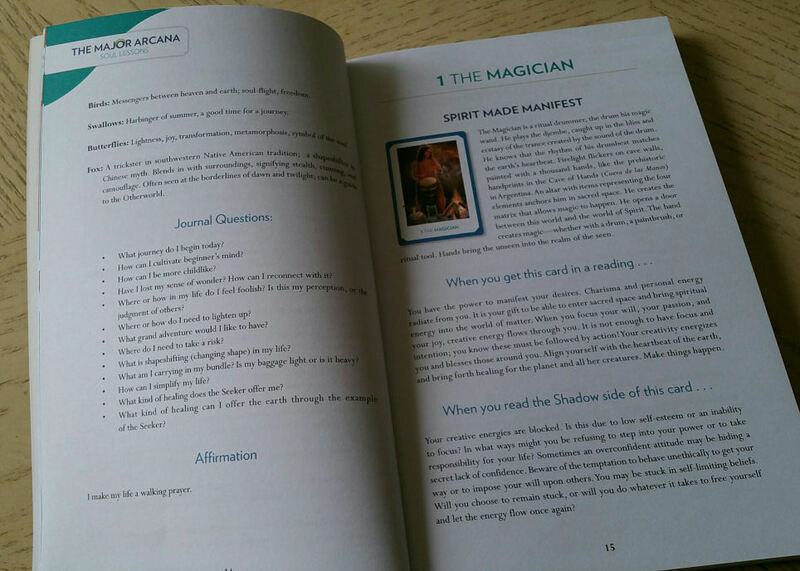 FTC Disclosure: In accordance with Title 16 of the U.S. Code of Federal Regulations Part 255, “Guides Concerning Use of Endorsements and Testimonials in Advertising,” I received the tarot deck Gaian Tarot from Schiffer Publishing for prospective review. Everything I’ve said here is sincere and accurately reflects my opinion of the deck and book set. Love this deck and every one of your thoughtful and helpful reviews! I’m particularly interested in the guidebook accompanying this new release. 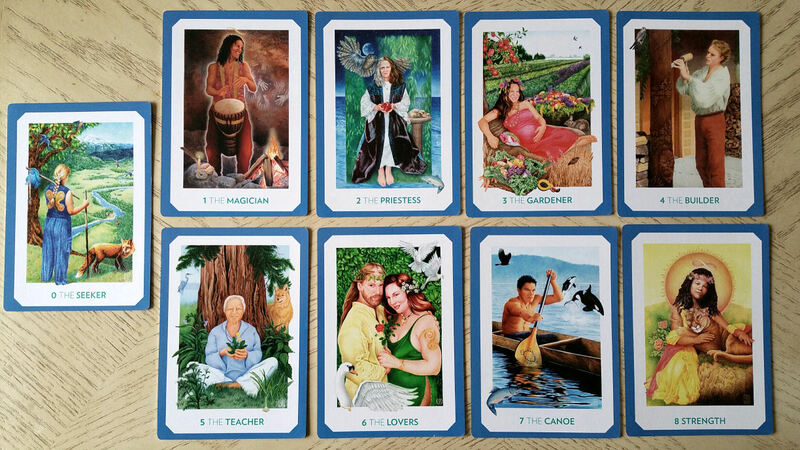 Gaian tarot has captured my heart and soul. I trust the messages coming through to be delivered with a gentleness so that a wound can be addressed honestly and sincerely with no further hurt required. The hardest answers are delivered with love. Impressive and most through review I’ve ever read about a tarot deck. Have followed the making of the Gaian Tarot deck and use it often. Have taking Joanna’s on-line classes. She presents tarot in a way that leads to compassion and understanding for making changes in a positive way for peaceful co-existence in a world sorely in need of such values. Everything Benebell does is exceptional…. So looking forward to this deck! I hadn’t realized that it was being reprinted until I read your review. I of course rushed off to order a copy 😉 Thanks for another brilliant review, Bell! I am a Certified Angel Card reader and take just about every class I can access. I love to learn. Like many readers, I have become something of a collector. I suspect we are secretly awaiting “the One.” Deck after deck after oracle after oracle arrive at my home. I open them with eager abandon delighting in their imagery, even amidst the realization that this newest treasure is not the one. The Chrysalis came close…oh so very close. Reading with this deck is a delight. 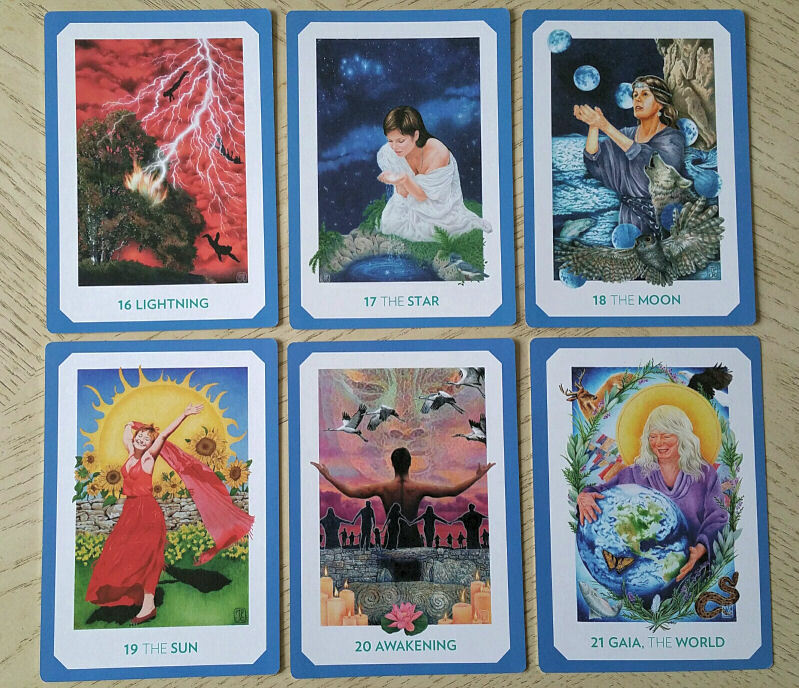 The images and messages ring true, the cards tell their own story. And the applications this deck has for problem solving are astounding. 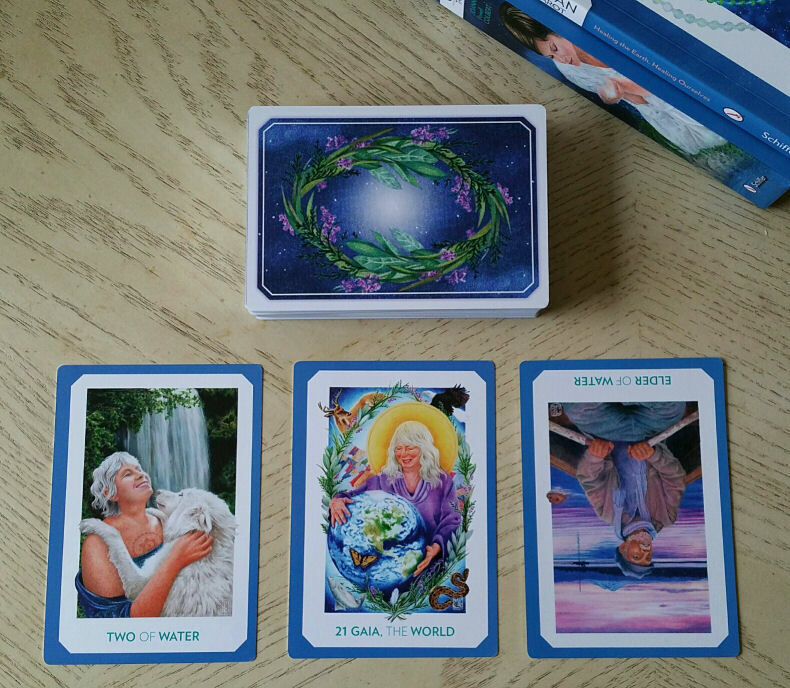 I have started creating spreads specific to solving family issues and this deck completely fits the bill. Spreads that use a card to identify the central issue, each persons’ perception, and what MY part is in bringing the situation back to harmony are excellent. I know we are all different but, on the most crucial level, we are so much more alike than not. The Gaian Tarot celebrates all of life and I simply cannot recommend this deck enough. This was a terrific review, Benebell. I have come to really enjoy your reviews as a source of sound guidance about the decks that are being produced. Thank you so much for helping me to make this purchase. Bright Blessings to you and yours!